"F1 2011" redirects here. For the video game based on the 2011 Formula One season, see F1 2011 (video game). Sebastian Vettel successfully defended his World Championship, eclipsing Fernando Alonso as the youngest double World Champion in Formula One history. McLaren's Jenson Button came in second behind Vettel by a then record gap of 122 points. Mark Webber, Vettel's teammate, finished third in the championship for the second season in succession. The 2011 FIA Formula One World Championship was the 65th season of FIA Formula One motor racing. The original calendar for the 2011 Formula One World Championship consisted of twenty rounds, including the inaugural running of the Indian Grand Prix before the cancellation of the Bahrain Grand Prix. Pirelli returned to the sport as tyre supplier for all teams, taking over from Bridgestone, marking their return to Formula One for the first time since the 1991 season. Red Bull Racing was the reigning Constructors' Champion. Red Bull Racing's Sebastian Vettel was the defending Drivers' Champion, one of five World Champions appearing on the grid. Vettel won his second World Championship at the 2011 Japanese Grand Prix, becoming the youngest driver, at 24 years and 98 days, to do so. Red Bull Racing won the Constructors' Championship. After a dispute between the Formula One Teams Association (FOTA) and the FIA in the first half of 2009, a new Concorde Agreement was signed on 1 August 2009 by the then FIA president Max Mosley and all of the existing teams at the time. The new agreement provides for a continuation of the terms of the 1998 agreement, and runs until 31 December 2012. The FIA published a provisional entry list on 30 November 2010, which was revised on 2 December 2010. Teams competed with tyres supplied by Pirelli. Following USF1's inability to make the grid in 2010, the FIA opened a new selection process to find an additional team to occupy the empty slot, as well as possible reserve entrants for the event of other withdrawals. Fifteen entry bids were reported to have been received, including ART Grand Prix, winners of several championships in feeder series; previous 2010 applicants Stefan Grand Prix and World Series by Renault team Epsilon Euskadi; and a joint effort by 1997 World Champion Jacques Villeneuve with Durango, the former Italian GP2 team that had encountered financial difficulties. However, the number of applicants declined, as ART Grand Prix and Cypher, the renamed USF1 operation, withdrew their entries, and the FIA decided ahead of the 2010 Italian Grand Prix that none of the prospective entrants met the minimum funding or engineering requirements, leaving the grid slot vacant. Following the confirmation that there would be no new additions to the grid for 2011, Joan Villadelprat of Epsilon Euskadi and Jacques Villeneuve of the combined Villeneuve-Durango teams both announced that they would still attempt to join the grid for 2011, exploring the possibilities of taking over an existing team. Villeneuve later admitted to considering possibilities outside of Formula One, including extending his NASCAR Nationwide Series campaign, or moving to Australia to pursue opportunities in the V8 Supercars. The season started with controversy when two teams using the Lotus name were entered onto the grid, Lotus Renault GP (foreground) and Team Lotus (background). At the British Grand Prix, Scuderia Ferrari announced they would remove Marlboro from their official team name in response to what they described as "recent concerns" regarding their association with the tobacco brand. Hispania announced several major partnerships in November 2010. Chief among these was an arrangement that saw Williams supply the Murcia-based team with transmission systems for the 2011 season, whilst forming a partnership with Spanish businessman Juan Villalonga, who was previously affiliated with Minardi as CEO of Telefónica. In July 2011, Thesan Capital, a Madrid-based investment company purchased a controlling stake in the team from owner José Ramón Carabante. Thesan Capital announced the team's operations would continue as they had before the purchase, and that they had no plans to change the team name or alter its operational structure. In a statement released to the media, Thesan Capital described their intentions as making the team "more Spanish" and settling the team within Spain; the team had previously been supported by a complex ownership arrangement that saw team principal Colin Kolles control the physical team, with Carabante owning the rights to the team's entry. Lotus Racing team principal Tony Fernandes purchased the rights to the Team Lotus name from David Hunt, with the intention of renaming the team to reflect its historical counterpart for the 2011 season. The use of the Team Lotus name led to a naming dispute with Lotus Cars. The team announced that they had terminated their three-year contract with engine supplier Cosworth; and used Renault engines from 2011. On 8 December 2010, Lotus Cars announced a partnership with Renault F1 that saw the British sports car manufacturer become title sponsor of the team, with a view to taking full control over the next few years. Confusion over the exact status over ownership of the team led team principal Éric Boullier to clarify that Genii Capital has full ownership of the team, with former owners Renault retreating to a position as engine supplier. The team was then known as Lotus Renault GP, and the chassis and constructor still known as Renault for reasons related to the Concorde Agreement, similar to Sauber retaining the "BMW Sauber" name in 2010 despite the departure of BMW at the end of 2009. In March 2011, it was announced that Infiniti, the luxury brand of Japanese car manufacturer Nissan of whom Renault own a 44% stake, would become a major sponsor of Red Bull Racing. However, contradictory to early reports, the arrangement with Infiniti had not extended to an engine re-branding. BMW Sauber announced in July 2010 that it will revert to the name Sauber in 2011. The team was forced to retain the BMW naming for 2010 due to issues involving television rights money that would not have been paid had the team changed their name. After a Williams demonstration run in Caracas, it was confirmed that Venezuelan state-controlled oil company PDVSA would enter into a long-term sponsorship deal with the team, replacing outgoing sponsors RBS, Philips and AirAsia. AirAsia officially left Williams F1 to concentrate on Team Lotus. After sponsoring the team for the 2010 season, Russian sports car manufacturer Marussia acquired what they termed a "significant stake" of Virgin Racing, with the team changing its name to Marussia Virgin Racing. Further reports confirmed that Marussia had purchased a controlling stake in the team, securing their future until 2014. The team split with Wirth Research mid-season after a technical review by former Renault F1 Team engineering director Pat Symonds found that Virgin's CFD-only approach had failed. In the week before the British Grand Prix, Virgin announced a technical partnership with McLaren that granted them access to McLaren's testing facilities as well as the purchase of Wirth Research facilities. DAMS GP2 driver Jérôme d'Ambrosio replaced Lucas di Grassi at Virgin Racing, having previously driven for the team during Friday practice sessions at selected events in 2010. Di Grassi did not have his contract with Virgin Racing renewed. With only a handful of vacant racing seats available ahead of the winter testing period, he announced that would concentrate on a return to the sport in 2012 rather than attempt to secure a seat in 2011. DTM champion Paul di Resta replaced Vitantonio Liuzzi at Force India, having previously driven for the team during Friday practice sessions at selected events in 2010. Nico Hülkenberg was dropped by Williams on the eve of the 2010 Abu Dhabi Grand Prix. After turning down offers from several teams, including HRT and Virgin, Hülkenberg joined Force India as test and reserve driver. As a part of his arrangement with the team, Hülkenberg will drive a VJM04 in the Friday morning free practice session of each Grand Prix. Narain Karthikeyan returned to Formula One with Hispania after last racing with Jordan Grand Prix in 2005, which was run at the time by Hispania team principal Colin Kolles. Karthikeyan also collaborated with Kolles on an unsuccessful attempt at the 2009 24 Hours of Le Mans, and he competed in the 2010 NASCAR Camping World Truck Series in a limited campaign. He also competed in an A1GP season for India. Robert Kubica was injured while competing in the Ronde di Andora rally during the winter off-season, leaving him with multiple fractures to his arm, hand and leg. The nature of his injuries were serious enough to prevent him from starting the season, while the surgeon who operated on Kubica has said that his recovery could take up to an entire year. His former BMW Sauber teammate Nick Heidfeld was later confirmed as his replacement at Lotus Renault GP. After being released from his contract with Force India one year in advance of its expiration, Vitantonio Liuzzi officially joined Hispania Racing as their second driver at the final test of the season, filling the last vacant racing seat on the grid. As a result of this, Hispania's part-time racing drivers Karun Chandhok, Christian Klien and Sakon Yamamoto were all unable to secure contracts to race. 2010 GP2 Series champion Pastor Maldonado was signed by Williams after testing for the team in the young driver tests in Abu Dhabi. Sergio Pérez, runner-up in the GP2 Series for Barwa Addax, was signed by Sauber to partner Kamui Kobayashi. His signing coincided with the announcement of a partnership between Carlos Slim's telecommunications group Telmex and the Sauber team. Pérez would become the first Mexican driver to race in Formula One since Héctor Rebaque last raced for Brabham at the 1981 Caesars Palace Grand Prix. Bruno Senna left Hispania Racing after a single season. Comments made by team principal Colin Kolles suggested that the nephew of three-time World Champion Ayrton Senna had a strained relationship with the team. Senna was later confirmed to have joined Lotus Renault GP as a part of their test and reserve team, and is the first in line to take over driving duties should either of the team's established drivers be unable to race. Sakon Yamamoto moved from Hispania Racing as a full-time driver to become a test driver for Virgin Racing for the first three races after he was unable to secure a contract to continue racing with Hispania. Pedro de la Rosa replaced Sergio Pérez at the Canadian Grand Prix due to Pérez feeling unwell after the first practice session, following a heavy crash at the previous round in Monaco. On 30 June, Hispania Racing announced that Australian Daniel Ricciardo – at the time testing and reserve driver for Scuderia Toro Rosso and racing for ISR in the Formula Renault 3.5 Series – would be replacing Narain Karthikeyan for the remainder of the 2011 season in what was described as an audition for a future race seat with Scuderia Toro Rosso. Karun Chandhok returned to Formula One, replacing Jarno Trulli at Team Lotus for the German Grand Prix, having previously fulfilled a Friday testing role in Melbourne, Istanbul, Valencia and Silverstone. Chandhok's last race meeting had been the 2010 British Grand Prix when he raced for Hispania. Trulli returned to the car for the Hungarian Grand Prix. On 24 August, it was announced that Bruno Senna would replace Nick Heidfeld at Renault for the Belgian and Italian Grands Prix, leading to uncertainty over the status of the seat from the Singapore Grand Prix onwards. The team cited Heidfeld's failure to deliver speed to take on the role of a strong leader as the reason for his dismissal, rather than financial reasons. Renault indicated that they wished for Senna to race for the rest of the season, but "legal issues" threatened Senna's contract with the team. On 2 September, Renault confirmed that Heidfeld's contract had been legally terminated and Senna would drive alongside Vitaly Petrov for the remainder of the season. Narain Karthikeyan returned to Hispania for the Indian Grand Prix, replacing Daniel Ricciardo in the 22 car which meant Ricciardo replaced Liuzzi in the 23 car. Liuzzi returned to the team for the Abu Dhabi Grand Prix. The Yas Marina Circuit was to be reconfigured for the Abu Dhabi Grand Prix following heavy criticism over a lack of overtaking in the 2010 race. The organisers of the race elected to postpone the circuit modifications for one year in the face of rule changes – the introduction of Pirelli tyres and the Drag reduction system – that they felt directly addressed the criticisms levelled at the circuit. The Bahrain Grand Prix was originally scheduled to be the opening race of the season on 13 March, but was called off by the organisers in light of anti-government protests in the country. A final decision on whether the race was to be rescheduled for later in the year or cancelled outright had to be made by 3 June. At this meeting the World Motor Sport Council (WMSC) voted unanimously to reinstate the race to the calendar, rescheduling it for 30 October 2011. The inaugural Indian Grand Prix would have moved to be the final race of the season in December to accommodate the change. However, the Formula One Teams Association (FOTA) opposed the rescheduling. One week after the WMSC voted to return the race to the calendar, organisers for the Bahrain Grand Prix officially abandoned their bid to return to the calendar. The Indian Grand Prix was restored to its original date. The German Grand Prix moved from the Hockenheimring to the Nürburgring, in keeping with the event-sharing arrangement between the two circuits. The 2011 season saw the addition of the Indian Grand Prix to the calendar. Originally known as the Jaypee Group Circuit, the venue was officially renamed the Buddh International Circuit in April 2011. Airtel was subsequently announced as title sponsor for the inaugural race. The Malaysian Grand Prix changed its name to the Malaysia Grand Prix as part of efforts to promote the country. 2011 saw the return of the 107% rule in qualifying. Under this arrangement, any driver who fails to set a time within 107% of the fastest lap in Q1 may not be permitted to take part in the race; for instance, if the fastest lap is 1 minute 40 seconds (100 seconds), a driver must set a time faster than 1 minute 47 seconds (107 seconds) in order to make it to the grid. However, if a driver who fails to set an appropriate lap time can show cause for his inclusion in the race – for example, if a driver failed to set a lap time in qualifying due to a mechanical fault, but had previously set a lap time within 107% of the pole-sitter's time in free practice – the stewards may allow that driver to take part in the race. The ban on team orders – the practice of teams ordering a driver to follow instructions that would be advantageous to their teammate (for example, ordering them to move aside and allow their teammate to pass them) – was lifted after the 2010 German Grand Prix, with the practice to be "regulated" on the race track. The practice of coding instructions to conceal the nature of the order would be banned to prevent deception to the spectators and stewards. The FIA increased the maximum allowable penalty which racing stewards can issue to teams from $100,000 to $250,000. Sole tyre supplier Bridgestone announced that it would not renew its contract with Formula One at the end of the 2010 season, with Pirelli chosen as the tyre supplier for 2011 by the FIA World Motor Sport Council. The Pirelli logo on each tyre was colour-coded to identify each compound and tread pattern being used. Cars had a mandatory weight distribution to provide Pirelli with a technical specification, and preventing teams making changes to the internal configuration of their cars should they prove not to suit the cars. At the final test in Barcelona, it was revealed that drivers would need to make three pit stops at most races, in line with Pirelli's mandate to design a higher wearing tyre. The Belgian Grand Prix saw a small controversy when several teams discovered their tyres had blistered during qualifying, but were not permitted to change their tyres ahead of the race because the damage was the result of the car set-up rather than an accident. Pirelli pointed to Red Bull Racing's practice of running camber settings that were outside their recommended parameters as the cause of the blistering, and said they would be more cautious with their recommendations for Monza to prevent the problem from arising again. Pirelli stated that they were willing to turn to the FIA to enforce camber limits if there was any evidence of blistering after the Free Practice sessions in Italy. The FIA later announced that Pirelli's camber limits were mandatory and that any team who failed to observe them would be reported to the stewards under Article 2.3 of the sport's technical regulations for dangerous construction and would risk exclusion from the race. The maximum height of the diffuser was cut from 175 millimetres (6.9 in) to 125 millimetres (4.9 in) and the double diffuser designs, introduced in the 2009 season, were excluded, in order to reduce aerodynamic downforce and turbulent air. Banned with this are double exhaust-blown diffusers, which use exhaust gases re-routed over the diffuser to increase downforce, although single blown diffusers are still allowed. Controversy emerged over the use of "off-throttle blown diffusers" early in the season, with the FIA first banning the concept and then repealing the ban pending discussion with the teams. The off-throttle blown diffuser increases downforce by keeping the engine spinning while the car is under braking, channelling hot exhaust gasses over the diffuser and allowing for higher cornering speeds. The FIA announced that the ban would be reintroduced from the British Grand Prix, limiting the amount of throttle that can be applied during braking. Tighter restrictions were to be introduced for the 2012 season. At the European Grand Prix – two weeks before the British Grand Prix – a further ban was introduced, prohibiting teams from using "extreme" engine maps in qualifying that they would not normally use in races, effectively forcing teams to use the same engine maps in both qualifying and the race. The FIA estimated that the clampdown on extreme engine maps would cost some teams up to half a second per lap in qualifying alone. The mid-season ban was later repealed when several teams applied for concessions to the ban, which were granted and subsequently revoked following protests from other teams. An agreement signed after the British Grand Prix abandoned the ban for the 2011 season entirely, restoring the pre-Valencia rules. The "F-duct" system developed by McLaren and copied by other teams was banned, as the system relying on drivers blocking a gap in the cockpit was judged unsafe. The Drag reduction system (DRS), an adjustable rear wing designed to increase straight line speed, was introduced in the 2011 rules. The system operates under a similar principle to the "F-duct", and is designed to aid overtaking by negating all downforce flowing over the rear wing. The rules dictate that the DRS is only available to a driver within one second of the car in front on a marked designated area of the circuit, after the first two laps of a race. Use of the DRS is unlimited in free practice and qualifying, but prohibited in wet conditions. The system is expected to offer drivers an additional 15 km/h (9.3 mph) when passing, and deactivates when the driver first touches the brakes after using the rear wing. At the Spanish Grand Prix, the FIA announced plans for a secondary DRS zone to be included on a circuit from the Canadian Grand Prix onwards. The number of wheel tethers – the load-bearing cables connecting the wheel hubs to the bodywork – was doubled for 2011, in response to an increasing number of accidents where wheels have been torn free of their mountings, including the death of Henry Surtees in a Formula Two race at Brands Hatch in 2009. Several smaller aerodynamic devices introduced for 2010 were also banned, including aerodynamic wheel spokes, flexible front splitters designed to lower front ride height, and modifications to the monocoque that create a V-shaped channel running the length of the car's nose. The maximum aspect ratio of the "bladed" rollbar structure – pioneered by Mercedes to decrease the obstruction of air to the rear wing – was also reduced. The 2011 Lotus T128 and Force India VJM04 cars were both launched with a similar device, based on the same principle as the Mercedes device, but the Lotus and Force India variants are legal under the rules because the blade structure is thicker than the one developed by Mercedes. KERS units were optional for all teams, after not being utilised in 2010 following a team agreement banning the devices, and the minimum car weight increases from 620 kilograms (1,367 lb) to 640 kilograms (1,411 lb), compensating for the extra weight required. Gearboxes must also last for five races instead of four, with an additional gearbox available without penalty for the purposes of completing an event. At the Hungarian Grand Prix, the FIA introduced new software to track the cars in order to better spot racing incidents and provide the stewards with real-time information about drivers breaking rules. The software was introduced in response to an incident at the German Grand Prix that saw Sébastien Buemi and Nick Heidfeld collide on the tenth lap of the Grand Prix, ending Heidfeld's race, but no penalty was issued to Buemi until after the race had ended. The FIA tightened its driving standards, moving to prevent overly aggressive driving and driving beyond the boundaries of the circuit to gain an advantage by implementing stricter penalties for drivers observed to be doing so. Drivers are limited in the number of blocking moves they can make on track, to allow easier overtaking. At the Korean Grand Prix, the FIA announced plans to introduce a stricter version of the "one move" defensive driver rule, in light of a protracted on-track battle between Michael Schumacher and Lewis Hamilton at the Italian Grand Prix. Under the original set of rules, a defending driver would be entitled to make one move across the circuit to select their racing line into an approaching corner; under the regulations introduced for the Korean Grand Prix, a defending driver would be obligated to leave enough space – defined as "one car's width" – on the outside of a corner for an attacking driver to occupy, preventing the defending driver from forcing his rival off the circuit. Further rule amendments granted greater powers to the race stewards. This was reported as a response to a series of on-track incidents involving Lewis Hamilton that culminated in several drive-through penalties; Hamilton received six driver penalties over the course of the 2011 season, setting a new record for the most penalties in a season. From the Korean Grand Prix on, the stewards had the power to issue reprimands alongside penalties, with a grid penalty being awarded after three reprimands. A curfew was implemented for team personnel, barring them from accessing the circuit in the nine hours before the first session of the day The rule was introduced following concerns over mechanics spending all night in the pit garage before spending the day in the busy pit lane, with four exceptions allowed for the season. In the event that this rule is broken after all four exceptions have been used, both cars for the offending team must start the race from pit lane. The rule attracted criticism at the Singapore Grand Prix when several teams inadvertently broke curfew, using up one of their four exceptions when members of the teams' marketing divisions arrived early at the circuit. Team members deemed to be in key roles were required to undergo accreditation for a "competitors' staff licence" in order to maintain their positions within their teams. This is seen as a reaction to the actions of disgraced former Renault team principal Flavio Briatore at the controversial 2008 Singapore Grand Prix and applies to key staff in all FIA-sanctioned World Championships including Formula One. The pre-season testing season began immediately after the 2010 Abu Dhabi Grand Prix with a three-day 'Young Driver Test' (for drivers with fewer than three Formula One race starts to their name) at the Yas Marina Circuit. Formula Renault 3.5 runner-up Daniel Ricciardo consistently set the fastest times over the three days, driving for new champions Red Bull Racing. The Young Driver Tests were followed by another testing session – also held at Yas Marina – for the teams to test the tyres developed by new tyre supplier Pirelli. Ferrari's Felipe Massa was the fastest during the tests, with many drivers declaring their satisfaction with the new tyres, particularly given Pirelli's short development window. Sebastian Vettel experienced an explosive puncture on the final day, though an investigation by Pirelli attributed the incident to debris on the circuit rather than a critical error with the build of the tyre. The final test of the season was originally scheduled to be held in Bahrain, but was cancelled by the Bahraini Crown Prince due to a political uprising in the island nation. It was instead rescheduled to the Circuit de Catalunya in Barcelona from 8–12 March. Defending World Champion Sebastian Vettel won the opening race of the season in Melbourne after qualifying on pole position by eight-tenths of a second. Lewis Hamilton finished in second place, and Russian driver Vitaly Petrov attained his maiden podium in third, with Renault hailing his dramatic off-season turn-around after a difficult debut season in 2010. At the opposite end of the grid, the Hispania F111 cars driven by Narain Karthikeyan and Vitantonio Liuzzi both failed to qualify as their qualifying times were both outside 107% of Vettel's fastest time in the first qualifying session. The Saubers of Sergio Pérez and Kamui Kobayashi were disqualified for a technical infringement when their cars failed a post-race scrutineering inspection. Vettel continued his title defence in Malaysia, taking pole from Hamilton in the dying moments of the session by just one tenth of a second. Vettel went on to win the race by three seconds from Jenson Button, who also claimed second place in the points standings; with two wins, Vettel left Malaysia with twice as many points as the McLaren driver. Nick Heidfeld took Renault's second successive podium and Fernando Alonso made a mistake, making contact with Lewis Hamilton and forcing him to pit for a new front wing, and costing him a potential podium. Hamilton himself slipped down the order after changing to the harder prime tyres and struggling with grip. Vettel once again took pole in China, whilst teammate Webber made a poor tyre choice and was eliminated from the first qualifying period for the first time since the 2009 Bahrain Grand Prix. 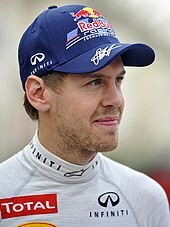 Vettel made a poor start in the race and was quickly overcome by the McLarens of Button and Hamilton. Button and Vettel pitted together, but Button made a bizarre mistake, mistakenly pulling up in the Red Bull pits, and allowing Vettel to get back out onto the circuit in front of him. The lead changed several times as the race progressed before Vettel settled into position, but on deteriorating tyres, he was caught and passed by Hamilton four laps from the end. 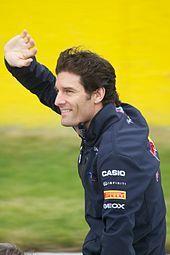 Having started in eighteenth position, Mark Webber recovered to achieve the third podium place. Sebastian Vettel earned his fourth pole of the season in Turkey, becoming the first person to start the first four races on pole since Mika Häkkinen in 1999. Vettel led the race from the lights to the flag, ahead of Mark Webber and Fernando Alonso, who gained Ferrari's first podium finish of the year. McLaren struggled with a series of slow pit stops, whilst the promise shown by Mercedes in qualifying was lost in the race when their cars were fuel-heavy and running on the harder prime tyre compound. Mark Webber ended Vettel's run of consecutive pole positions at the Spanish Grand Prix, but it was fourth-starting Fernando Alonso that led the field into the first corner and through much of the early phase of the race. He was eventually overtaken in the pits by Vettel, and slipped down the order to finish a lap behind as Ferrari struggled with Pirelli's brand-new "extra hard" compound, which was specifically designed for endurance, but was two seconds per lap slower than the softer compounds used. Vettel went on to win the race, but Red Bull's one-second advantage in qualifying was gone by the race as Lewis Hamilton spent most of the final stint within one second of the lead. After making a poor start and slipping down to tenth place, Jenson Button used a three-stop strategy to recover to third place. The Monaco Grand Prix was marred by a string of accidents throughout the weekend that saw two drivers hospitalised; Sergio Pérez crashed heavily at the Nouvelle Chicane in the final qualifying period and suffered a concussion, while Vitaly Petrov was briefly knocked unconscious in a five-car pile-up late in the race that saw the red flags waved and the race stopped for the first time since the 2010 Korean Grand Prix. Sebastian Vettel achieved both pole position and the race win ahead of Fernando Alonso and Jenson Button, who had been rapidly catching the race leaders at the time of the race stoppage. After nine races, Sebastian Vettel had not finished lower than second. He is seen here taking his fifth victory of the season at the Monaco Grand Prix. Vettel took his sixth pole of the season in Montreal, with the race severely affected by rain. The early stages of the race saw Jenson Button and Lewis Hamilton collide on the pit straight, and Button earning a drive-through penalty for speeding behind the safety car after it was deployed to retrieve the stricken McLaren of Hamilton. On lap twenty-five, the race was stopped for two hours in the face of a torrential downpour that made the circuit undriveable. When the race was finally resumed, a narrow dry line began to appear around the circuit, and Button began to work his way through the field, having run as low as twenty-first and last place after his penalty. With four laps to go, Button had passed Mark Webber and Michael Schumacher for second place and was catching Vettel at a rate that meant he would only catch the championship leader on the final lap. Vettel ran wide and off the dry line of the final lap of the race, handing Button the race win. Schumacher matched his best race result since returning to the sport, with a fourth place. At Sauber, Sergio Pérez elected not to compete after reporting that he felt unwell during the first practice session, and he was replaced by Pedro de la Rosa. Pirelli's medium-compound tyre made its race debut in Valencia, which once again saw Vettel on pole. There was much speculation about the potential for the field to be shaken up by the introduction of engine mapping bans, but the reigning champion led for most of the race, ceding the lead only when called in to pit. He comfortably gained his sixth victory of the season when the leaders moved onto the medium compound tyres, with second-placed Fernando Alonso demonstrating that the Ferrari 150° Italia was unable to use the medium tyres as efficiently as the Red Bull RB7. With all twenty-four cars finishing the race, Hispania Racing's Narain Karthikeyan became the first man in the sport's history to finish a Grand Prix in twenty-fourth position as the race broke the record for the most classified finishers; the 2011 Chinese Grand Prix had previously seen twenty-three classified finishers. Uncertainty over rule changes and exemptions concerning the use of off-throttle blown diffusers dominated off-track discussion at the British Grand Prix, though consensus within the media was that the issue did not directly affect the sport. Mark Webber started from pole position in the race; however, Sebastian Vettel took the lead on the first lap. A mistake from Red Bull Racing in the pits allowed Fernando Alonso to take control of the race, which he went on to win by sixteen seconds, his first victory since the 2010 Korean Grand Prix. Webber caught Vettel in the dying stages of the race, but was given a late team order to maintain his position, and the Australian finished third behind his teammate. Felipe Massa was similarly catching Lewis Hamilton, whose progress had been hampered by an order to conserve fuel, for fourth position and the two made contact in the penultimate corner on the last lap, forcing Massa to run wide over the finish line. Jenson Button fell from second to fifth place in the championship when a wheel nut was improperly attached to his car during his final stop, forcing his retirement from the race. Webber achieved his second successive pole position in Germany, while Hamilton denied Red Bull a front-row lock-out by qualifying second. Vettel was third, the first time he had qualified outside the front row since the 2010 Italian Grand Prix almost one year previously. Hamilton took the lead going into the first corner of the race, and the early stages of the Grand Prix were marked by the drivers attempting to find grip on an unusually cold circuit. As Hamilton, Alonso and Webber pulled away, Vettel struggled to match their pace following a spin at turn ten. Michael Schumacher had an identical episode at the same corner a few laps later, whilst Sébastien Buemi and Nick Heidfeld collided at the chicane, ending Heidfeld's race. There were multiple lead changes between Hamilton, Webber and Alonso, with Hamilton capitalising on a slow in-lap by Alonso and a strategy error from Red Bull to secure victory. Alonso placed second, with Webber third, while Sebastian Vettel stole fourth away from Felipe Massa when the two drivers pitted on the final lap. Vettel returned to pole position in Hungary; however, Lewis Hamilton qualified second and was able to save an extra set of softer option tyres for the race. After mixed conditions wreaked havoc in the support races, the Grand Prix started with a wet surface. Vettel established an early lead, but was soon passed by Hamilton and Jenson Button as a dry line appeared. The positions remained constant through the halfway point of the race while Team Lotus experienced their second double-retirement in three races and Nick Heidfeld's Renault exploded after a prolonged pit stop. A mid-race shower on the fortieth lap led to Hamilton spinning, forcing Force India's Paul di Resta off the circuit and allowing Button to close the gap. The two McLaren drivers traded places several times in the greasy conditions, with Hamilton leading long enough to give him the first strategy call within the team. He opted to swap to the intermediate tyres, but the track started to dry out and he was given a drive-through penalty for forcing di Resta off the circuit, taking him out of contention for a podium finish. Jenson Button went on to win the race, his 200th Grand Prix start and the scene of his maiden victory ahead of Vettel in second and Fernando Alonso. Hamilton recovered from his penalty to take fourth position from Mark Webber, whilst Felipe Massa – who had out-qualified Alonso for the first time since the 2010 Belgian Grand Prix – was the final car classified on the lead lap in sixth place. The Belgian Grand Prix marked twenty years since Michael Schumacher's Formula One debut, but Schumacher had a difficult start to the weekend when he lost a wheel on his out-lap in qualifying, sending him to the back of the grid. Bruno Senna replaced Nick Heidfeld at Renault, qualifying seventh in variable conditions on his return to Formula One. However, his success was short-lived when he crashed into Jaime Alguersuari on the first lap, ending Alguersuari's race and earning himself a penalty. Nico Rosberg led the early stages of the race, but was powerless to defend against Sebastian Vettel once the DRS was activated. The lead changed several times in the first half of the race, but Vettel eventually established a comfortable lead and would remain unchallenged. With Vettel winning the race and Webber finishing second, Red Bull secured their first one-two victory since Istanbul. Despite leading the race at one point, Fernando Alonso struggled with his tyres, and slipped down the running order, being passed by Mark Webber and Jenson Button, who had recovered from thirteenth on the grid. Michael Schumacher also recovered; having started twenty-fourth on the grid, he was fifth at the end of the race, behind Alonso and ahead of Rosberg. Lewis Hamilton crashed out of the race early on, making contact with Kamui Kobayashi at Les Combes. Both Senna and Hamilton admitted responsibility for their respective incidents. At the Italian Grand Prix, Vettel took once again pole position, beating Hamilton by half a second, but it was the fourth-starting Fernando Alonso who led the race going into the first corner. Vitantonio Liuzzi made contact with Kovalainen and lost control, sliding off the grass and crashing heavily into Rosberg and Petrov and triggering the safety car. Vettel took the lead from Alonso one lap after the restart, while Schumacher overtook Hamilton. Mark Webber attempted to pass Felipe Massa, but the two made contact, pitching Massa into a spin. Webber continued with a broken front wing, crashing at Parabolica as he attempted to return to pit. Further down the order, Schumacher received several carefully worded instructions from team principal Ross Brawn, reminding him not to cut across the track to defend against Hamilton. Schumacher's duel with Hamilton slowed them down enough for Jenson Button to catch up; where Hamilton took thirty laps to pass Schumacher, Button passed him on his first attempt and started catching the second-placed Alonso. Vettel went on to win the race, extending his lead enough that he would need just one more win to win his second World Championship. Webber's failure to finish meant that he fell to fourth in the drivers' standings, behind Alonso and Button, while Hamilton's fourth place meant he fell further behind in the championship. Sebastian Vettel became the youngest double World Champion at the Japanese Grand Prix, by finishing third behind race winner Jenson Button and Fernando Alonso. Sebastian Vettel obtained his eleventh pole of the season in Singapore, and spent most of the race unchallenged. Jenson Button attempted a late push, but was held up by traffic in the final laps of the race and fell behind. Button's podium meant that the championship would remain unresolved for the time being, but with his ninth victory of the season, Sebastian Vettel closed to within one point of securing his second World Drivers' Championship and becoming the sport's youngest-ever double World Champion. Mark Webber completed the podium in third, while Fernando Alonso finished fourth, over a minute behind Vettel. An early collision with Felipe Massa meant Lewis Hamilton was handed a drive-through penalty – his sixth of the season – and slipped out of the points, but a mid-race safety car for a collision involving Michael Schumacher and Sergio Pérez helped Hamilton recover to fifth. However, the end result meant that Webber, Alonso and Hamilton were all eliminated from the championship fight. The championship came to a head in Japan, with Sebastian Vettel out-qualifying championship rival Jenson Button by just nine thousandths of a second. Vettel forced Button wide at the start, but the McLaren driver was able to recover, under-cutting Vettel in the pits during the second round of stops. Button went on to win the race, his third victory of the season, while Fernando Alonso finished second. Vettel completed the podium, securing his second World Drivers' Championship. Mark Webber finished the race fourth, with Lewis Hamilton fifth and Michael Schumacher defending from Felipe Massa to finish sixth. Nico Rosberg secured the final World Championship point in by finishing tenth, having started twenty-third on the grid. Lewis Hamilton and McLaren ended Red Bull's monopoly on pole position at the Korean Grand Prix, with Hamilton edging out Champion-elect Vettel by two-tenths of a second. Vettel seized the lead early in the race, and remained unthreatened for the rest of the race. Hamilton engaged in a race-long duel with Mark Webber, with the Australian following an unusual strategy choice. He was unable to pass Hamilton, who collected his first podium position since his victory in the German Grand Prix. Jenson Button finished the race fourth ahead of Fernando Alonso. In finishing first and third, Red Bull secured their second consecutive World Constructors' Championship. Vettel claimed his first "Grand Chelem" at the inaugural Indian Grand Prix, claiming pole position, the fastest lap and leading every lap of the race. The race saw several incidents on the first lap, with contact between several drivers at the first corner, and again at Turn 3. Jenson Button tightened his grasp on second place in the championship, finishing eight seconds behind Vettel, whilst Fernando Alonso completed the podium ahead of Mark Webber. Lewis Hamilton fell further behind after making contact with Felipe Massa at the halfway point, the third time the two had come together in four races. Narain Karthikeyan became the first Indian driver to compete in the Indian Grand Prix, finishing seventeenth ahead of Hispania teammate Daniel Ricciardo and Jarno Trulli, a victim of the first-lap contact. Sebastian Vettel equalled Nigel Mansell's record of fourteen pole positions in a season when he was fastest in qualifying at the Abu Dhabi Grand Prix. Vettel however – despite maintaining the lead into the first corner – spun off at Turn 2 with a right rear puncture. He pitted at the end of the lap and had to retire with suspension damage. Hamilton led the whole race, except the pit stop phases, and won the race ahead of Fernando Alonso and teammate Jenson Button. This meant that Red Bull's podium streak came to an end, despite Webber finishing fourth. At the final race of the season in Brazil, Vettel broke Mansell's record for most pole positions in a season, taking his fifteenth. Webber emerged victorious, scoring his first race win since the 2010 Hungarian Grand Prix. Hamilton retired on lap 48 with a gearbox problem, joining Pastor Maldonado, Timo Glock, and later Vitantonio Liuzzi on the list of race retirements. Felipe Massa, finishing fifth in his home race, became the first Ferrari driver since Ivan Capelli in 1992 who failed to finish on the podium all season. Meanwhile, Paul di Resta finished the season as the best rookie in 13th place for Force India. Points were awarded to the top 10 classified finishers. – Drivers did not finish the Grand Prix, but were classified as they completed more than 90% of the race distance. Official FIA results list the Constructors' Championship placings as Red Bull Racing, Vodafone McLaren Mercedes, Scuderia Ferrari etc. ^ Elizalde, Pablo (21 February 2011). "Prior to opening round in bahrain being cancelled". Autosport. Haymarket Publications. Retrieved 21 February 2011. ^ a b "Bernie Ecclestone reveals F1 extension to 20 races". BBC Sport. BBC. 16 April 2010. Archived from the original on 13 March 2012. Retrieved 17 April 2010. ^ a b c d "World Motor Sport Council: 23/06/2010". fia.com. Fédération Internationale de l'Automobile. 23 June 2010. Archived from the original on 26 June 2010. Retrieved 23 June 2010. ^ Beer, Matt (1 August 2009). "New Concorde Agreement finally signed". Autosport. Haymarket Publications. Retrieved 2 August 2009. ^ "2011 FIA Formula One World Championship". fia.com. Fédération Internationale de l'Automobile. 2 December 2010. Archived from the original on 6 January 2012. Retrieved 31 January 2014. ^ "Red Bull extend Vettel contract". GP Update. 21 August 2009. Retrieved 29 January 2011. ^ Collantine, Keith (7 June 2010). "Webber signs with Red Bull for 2011". F1 Fanatic. Keith Collantine. Archived from the original on 10 June 2010. Retrieved 7 June 2010. ^ "Lewis extends McLaren stay until 2012". Manipe F1. 18 January 2008. Archived from the original on 11 February 2009. Retrieved 19 May 2008. ^ "Vodafone McLaren Mercedes signs reigning World Champion Jenson Button to multi-year deal". mclaren.com. Vodafone McLaren Mercedes. 18 November 2009. Archived from the original on 20 November 2009. Retrieved 18 November 2009. ^ a b Collantine, Keith. "Ferrari drops 'Marlboro' from official team name". F1 Fanatic. Retrieved 9 July 2011. ^ "Ferrari tweaks car's name again". Autosport. Haymarket Publications. 4 March 2011. Retrieved 4 March 2011. ^ "Press Release". Scuderia Ferrari. Ferrari. 30 September 2009. Archived from the original on 23 February 2012. Retrieved 23 June 2011. ^ Elizalde, Pablo (9 June 2010). "Massa extends Ferrari contract until '12". Autosport. Haymarket Publications. Archived from the original on 11 June 2010. Retrieved 9 June 2010. ^ "Schumacher could stay in F1 after 2012". espnf1.com. ESPN. 27 January 2010. Retrieved 25 July 2010. ^ "Mercedes looking to bolster team for 2011 campaign". ESPN. 30 September 2010. Archived from the original on 1 October 2010. Retrieved 30 September 2010. ^ Noble, Johnathan (8 December 2010). "Lotus unveils F1 plans with Renault". Autosport. Autosport. Archived from the original on 20 December 2010. Retrieved 8 December 2010. ^ Noble, Johnathan (13 January 2011). "Renault to switch to British licence". Autosport. Autosport. Retrieved 13 January 2011. ^ "Genii Capital and Group Lotus join forces in Lotus Renault GP". renaultf1.com. Renault F1 Team. 8 December 2010. Archived from the original on 10 December 2010. Retrieved 8 December 2010. ^ a b "Renault confirm Heidfeld as Kubica stand-in". formula1.com. Formula One Administration. 16 February 2011. Archived from the original on 17 February 2011. Retrieved 16 February 2011. ^ a b Strang, Simon (31 January 2011). "Renault unveils its 2011 challenger". Autosport. Haymarket Publication. Retrieved 31 January 2011. ^ "Grosjean announces Renault third driver role for 2011". Motorsport.com. GMM. 31 January 2011. Retrieved 31 January 2011. ^ a b "Bruno Senna to race for Lotus Renault GP". Lotus Renault GP. Renault F1. 24 August 2011. Retrieved 24 August 2011. ^ "Petrov confirmed at Renault until 2012". formula1.com. Formula One Administration. 22 December 2010. Archived from the original on 24 December 2010. Retrieved 22 December 2010. ^ "Williams retains Barrichello for 2011". Autosport. Haymarket Publications. 15 November 2010. Archived from the original on 20 December 2010. Retrieved 15 November 2010. ^ a b Beer, Matt (1 December 2010). "Williams announces Maldonado for '11". Autosport. Haymarket Publications. Retrieved 1 December 2010. ^ a b c d e Elizalde, Pablo (26 January 2011). "Di Resta confirmed at Force India". Autosport. Haymarket Publications. Retrieved 26 January 2011. ^ a b Noble, Jonathan (24 June 2010). "Sauber gets approval for name change". Autosport. Haymarket Publications. Archived from the original on 27 June 2010. Retrieved 24 June 2010. ^ Elizalde, Pablo (7 September 2010). "Sauber retains Kobayashi for 2011". Autosport. Haymarket Publications. Archived from the original on 9 September 2010. Retrieved 7 September 2010. ^ "Sauber Signs Perez". joesaward.wordpress.com. Joe Saward. 4 October 2010. Archived from the original on 7 October 2010. Retrieved 4 October 2010. ^ a b Benson, Andrew (10 June 2011). "Sergio Perez to miss rest of Canadian Grand Prix". BBC Sport. British Broadcasting Corporation. Retrieved 10 June 2011. ^ a b "Get ready for the noise". Scuderia Toro Rosso. Red Bull. 19 January 2011. Archived from the original on 16 July 2011. Retrieved 21 January 2011. ^ Beer, Matt (26 November 2010). "Ricciardo gets STR Friday practice role". Autosport. Haymarket Publications. Archived from the original on 20 December 2010. Retrieved 26 November 2010. ^ Benson, Andrew (26 August 2011). "Frenchman Jean-Eric Vergne to get F1 chance with Toro Rosso". BBC F1. BBC. Retrieved 27 August 2011. ^ English, Steven; Noble, Jonathan (24 September 2010). "Lotus confirms Team Lotus name deal". Autosport. Haymarket Publications. Archived from the original on 27 September 2010. Retrieved 24 September 2010. ^ Collantine, Keith (5 November 2010). "Lotus confirm 2011 Renault engine deal, Red Bull extend contract". F1 Fanatic. Keith Collantine. Archived from the original on 7 November 2010. Retrieved 5 November 2010. ^ a b "Lotus F1 team keep Heikki Kovalainen and Jarno Trulli". BBC Sport. BBC Sport. 30 November 2010. Retrieved 9 March 2011. ^ "Karun Chandhok has been confirmed as Reserve Driver for Team Lotus". teamlotus.co.uk. Team Lotus. 22 March 2011. Archived from the original on 25 March 2011. Retrieved 22 March 2011. ^ a b "2011 Test Driver Line-up". teamlotus.co.uk. Team Lotus. 11 March 2011. Archived from the original on 13 March 2011. Retrieved 11 March 2011. ^ a b Benson, Andrew (21 July 2011). "Karun Chandhok replaces Jarno Trulli for German GP". BBC Sport. BBC. Archived from the original on 21 July 2011. Retrieved 21 July 2011. ^ a b Noble, Jonathan (6 January 2011). "Karthikeyan signs race deal with HRT". Autosport. Haymarket Publications. Retrieved 6 January 2011. ^ a b c Beer, Matt (30 June 2011). "Hispania confirms Daniel Ricciardo will race for it from Silverstone". Autosport. Haymarket Publications. Retrieved 30 June 2011. ^ Elizalde, Pablo (24 November 2011). "Jan Charouz to drive for HRT during first practice for the Brazilian Grand Prix". Autosport. Haymarket Publications. Retrieved 24 November 2011. ^ a b "Hispania Racing keeps on growing with skilled and expert Liuzzi". Hispania Racing. Hispania. 9 March 2011. Archived from the original on 12 March 2011. Retrieved 9 March 2011. ^ "2011 Formula 1 Airtel Grand Prix of India: Practice 1 Results". Formula1.com. Formula One Administration. 28 October 2011. Archived from the original on 30 October 2011. Retrieved 28 October 2011. ^ a b Smotrov, Alexandr (11 November 2010). "Russia enters Formula 1 as company takes 'significant stake' in Virgin team". RIA Novosti. Archived from the original on 14 November 2010. Retrieved 11 November 2010. ^ "F1 Marussia Virgin Racing team to compete under Russian flag". RIA Novosti. 3 February 2011. Retrieved 3 February 2011. ^ Elizalde, Pablo (3 December 2010). "Glock says he is not going anywhere". Autosport. Haymarket Publications. Retrieved 3 December 2010. ^ "Wickens becomes Virgin Racing reserve". GPUpdate.net. GP Update. 3 June 2011. Retrieved 3 June 2011. ^ a b "The new face of Marussia Virgin Racing". virginracing.com. 21 December 2010. Archived from the original on 24 December 2010. Retrieved 21 December 2010. ^ Elizalde, Pablo (19 March 2010). "FIA invites teams for 2011 selection". Autosport. Haymarket Publications. Archived from the original on 22 March 2010. Retrieved 22 March 2010. ^ "15 teams apply for final F1 grid place". Motorsport.com. 26 May 2010. Archived from the original on 9 June 2011. Retrieved 16 May 2010. ^ "ART Grand Prix submits 2011 F1 application". GP Update. 13 May 2010. Archived from the original on 16 May 2010. Retrieved 13 May 2010. ^ "Epsilon Euskadi expresses interest in F1 spot". ESPN F1. ESPN. 22 March 2010. Archived from the original on 25 March 2010. Retrieved 22 March 2010. ^ Cooper, Adam (23 April 2010). "F1: Stefan GP Says It Will Bid For Entry Slot". SPEED-TV.com. Fox Sports. Archived from the original on 25 April 2010. Retrieved 24 April 2010. ^ Cooper, Adam (17 July 2010). "Durango confirms Villeneuve partnership". Adam Cooper's F1 Blog. Adam Cooper. Archived from the original on 23 July 2010. Retrieved 18 July 2010. ^ Beer, Matt (7 July 2010). "ART withdraws 2011 F1 entry bid". Autosport. Haymarket Publications. Archived from the original on 9 July 2010. Retrieved 8 July 2010. ^ Elizalde, Pablo (30 July 2010). "Cypher Group withdraws F1 application". Autosport. Haymarket Publications. Archived from the original on 2 August 2010. Retrieved 30 July 2010. ^ "World Motor Sport Council Decisions – 8 September 2010". FIA. 8 September 2010. Archived from the original on 11 September 2010. Retrieved 18 November 2010. ^ Collantine, Keith (8 September 2010). "Epsilon Euskadi not giving up on F1". F1 Fanatic. Keith Collantine. Archived from the original on 10 September 2010. Retrieved 9 September 2010. ^ "Villeneuve not giving up on F1 team plans". motorsport.com. GMM. 8 September 2010. Retrieved 9 September 2010. ^ Beer, Matt (20 October 2010). "Villeneuve eyes V8 future". Autosport. Haymarket Publications. Archived from the original on 23 October 2010. Retrieved 20 October 2010. ^ "Sahara India Pariwar announces co-ownership of the Force India Formula One Team with Dr. Vijay Mallya". forceindiaf1.com. Force India F1 Team. 12 October 2011. Archived from the original on 14 October 2011. Retrieved 12 October 2011. ^ Elizalde, Pablo (2 November 2010). "Williams to supply gearboxes to HRT". Autosport. Haymarket Publications. Archived from the original on 4 November 2010. Retrieved 2 November 2010. ^ Beer, Matt (6 November 2010). "Ex-Telefonica CEO joins Hispania". Autosport. Haymarket Publications. Archived from the original on 9 November 2010. Retrieved 6 November 2010. ^ Collantine, Keith (4 July 2011). "Thesan Capital takes control of HRT F1 team". F1 Fanatic. Keith Collantine. Retrieved 4 July 2011. ^ Beer, Matt (4 July 2011). "Spanish investment company Thesan Capital becomes majority Hispania shareholder". Autosport. Haymarket Publications. Retrieved 4 July 2011. ^ Noble, Jonathan (12 September 2010). "Lotus to adopt Team Lotus name". Autosport. Haymarket Publications. Archived from the original on 14 September 2010. Retrieved 12 September 2010. ^ Elizalde, Pablo (12 September 2010). "Cosworth, Lotus agree to end deal". Autosport. Haymarket Publications. Archived from the original on 14 September 2010. Retrieved 13 September 2010. ^ Noble, Jonathan (24 September 2010). "Lotus secures Renault engine deal". Autosport. Haymarket Publications. Archived from the original on 26 October 2010. Retrieved 23 October 2010. ^ a b Noble, Jonathan; Straw, Edd (9 December 2010). "Group Lotus hints at full team takeover". Autosport. Haymarket Publications. Archived from the original on 20 December 2010. Retrieved 10 December 2010. ^ "Genii, not Group Lotus, owns Renault team – Boullier". Motorsport.com/GMM. 19 January 2011. Retrieved 19 January 2011. ^ Collantine, Keith (8 December 2010). "Renault will also become Lotus-Renault in 2011". F1 Fanatic. Keith Collantine. Retrieved 8 December 2010. ^ Noble, Jonathan (1 March 2011). "Infiniti becomes major RBR backer". Autosport. Haymarket Publications. Retrieved 1 March 2011. ^ Noble, Jonathan (1 March 2011). "Infiniti: No interest in engine badging". Autosport. Haymarket Publications. Retrieved 1 March 2011. ^ Noble, Jonathan (15 January 2011). "Williams announces PDVSA in Caracas". Autosport. Haymarket Publications. Retrieved 15 January 2011. ^ Holt, Sarah (11 November 2010). "Russian supercar firm Marussia takes over Virgin Racing". BBC Sport. BBC. Archived from the original on 12 November 2010. Retrieved 12 November 2010. ^ "Virgin to break ties with technical partners Wirth". Formula1.com. Formula One Association. 2 February 2011. Archived from the original on 29 June 2011. Retrieved 4 July 2011. ^ Noble, Jonathan (4 July 2011). "Virgin enters into technical partnership with McLaren". Autosport. Haymarket Publications. Archived from the original on 17 July 2011. Retrieved 4 July 2011. ^ Straw, Edd (19 January 2011). "Di Grassi eyes F1 return in 2012". Autosport. Haymarket Publications. Retrieved 20 January 2011. ^ "Hulkenberg leaving Williams announces manager Weber". Motorsport.com. GMM. 14 November 2010. Archived from the original on 17 November 2010. Retrieved 14 November 2010. ^ "Hulkenberg turned down Virgin drive – Weber". ESPN F1. ESPN Emea Ltd. 18 January 2011. Retrieved 19 January 2011. ^ "Hulkenberg confirms Friday deal with Force India". Motorsport.com. GMM. 3 February 2011. Archived from the original on 4 September 2012. Retrieved 3 February 2011. ^ Noble, Jonathan; Evans, David; Lostia, Michele (6 February 2011). "Kubica suffers multiple fractures". Autosport. Haymarket Publications. Retrieved 6 February 2011. ^ Collantine, Keith (6 February 2011). "Kubica's recovery could take a year, surgeon says". F1 Fanatic. Keith Collantine. Archived from the original on 9 February 2011. Retrieved 7 February 2011. ^ "Sauber Motorsport sign Sergio Perez as race driver and announce partnership with Telmex". Sauber Motorsport. Sauber Motorsport. 4 October 2010. Archived from the original on 7 October 2010. Retrieved 4 October 2010. ^ "Senna out of running for HRT drive – Kolles". ESPN F1. ESPN Emea Ltd. 7 January 2011. Retrieved 27 January 2011. ^ Collantine, Keith (31 January 2011). "Senna first in line for race seat at Renault". F1 Fanatic. Keith Collantine. Retrieved 1 February 2011. ^ Collantine, Keith (23 March 2011). "Yamamoto joins Virgin as reserve driver". F1 Fanatic. Keith Collantine. Retrieved 23 March 2011. ^ Noble, Jonathan (25 August 2011). "Bruno Senna guaranteed in Renault seat for Spa and Monza only". Autosport. Haymarket Publications. Retrieved 25 August 2011. ^ Noble, Jonathan (26 August 2011). "Nick Heidfeld didn't deliver speed or leadership, says Renault team principal". Autosport.com. Haymarket Publications. Retrieved 27 August 2011. ^ "Senna to replace Heidfeld at Renault for Spa & Monza – updated". Formula1.com. Archived from the original on 16 October 2011. Retrieved 25 August 2011. ^ Tremayne, Sam (22 October 2011). "Narain Karthikeyan says racing at home will be a surreal experience". Autosport. Haymarket Publications. Retrieved 22 October 2011. ^ a b "World Motor Sport Council: 08/09/2010". fia.com. Fédération Internationale de l'Automobile. 8 September 2010. Archived from the original on 11 September 2010. Retrieved 8 September 2010. ^ "World Motor Sport Council: 03/11/2010". fia.com. Fédération Internationale de l'Automobile. 3 November 2010. Archived from the original on 5 November 2010. Retrieved 3 November 2010. ^ Strang, Simon (8 April 2011). "Abu Dhabi to make track changes". Autosport. Haymarket Publications. Retrieved 8 April 2011. ^ Beer, Matt (4 July 2011). "Abu Dhabi Grand Prix postpones track changes as 2011 rules may make them unnecessary". Autosport. Haymarket Publications. Retrieved 6 July 2011. ^ "Bahrain Grand Prix called off due to protests". BBC Sport. BBC. 21 February 2011. Archived from the original on 24 February 2011. Retrieved 21 February 2011. ^ "Bahrain Grand Prix". fia.com. Fédération Internationale de l'Automobile. 2 May 2011. Archived from the original on 4 May 2011. Retrieved 2 May 2011. ^ a b Elizalde, Pablo (3 June 2011). "FIA reinstates Bahrain Grand Prix". Autosport. Haymarket Publications. Retrieved 3 June 2011. ^ Noble, Jonathan (7 June 2011). "FOTA requests delay to Bahrain return". Autosport. Haymarket Publications. Retrieved 7 June 2011. ^ "Bahrain GP cannot happen, says Bernie Ecclestone". BBC Sport. 8 June 2011. Archived from the original on 8 June 2011. Retrieved 8 June 2011. ^ Noble, Jonathan (9 June 2011). "Bahrain gives up on 2011 race". Autosport. Haymarket Publications. Retrieved 10 June 2011. ^ "Indian Grand Prix debut pushed back to 2011". The Daily Telegraph. London. 30 September 2008. Retrieved 18 January 2010. ^ "F1 Indian GP venue named 'Buddh International Circuit'". India Times. 9 April 2011. Archived from the original on 19 October 2012. Retrieved 10 April 2011. ^ "Airtel Grand Prix of India set to flag off India's F1 dreams". Formula1.com. 18 August 2011. Archived from the original on 23 September 2011. Retrieved 18 August 2011. ^ "Petronas extends Malaysian race sponsorship". formula1.com. 1 September 2010. Archived from the original on 4 September 2010. Retrieved 2 September 2010. ^ Collantine, Keith (23 June 2010). "FIA brings back 107% rule for 2011". F1 Fanatic. Keith Collantine. Archived from the original on 26 June 2010. Retrieved 23 June 2010. ^ "Team orders to be 'regulated' not banned – Todt". Motorsport.com. GMM. 19 November 2010. Retrieved 19 November 2010. ^ "FIA to increase maximum F1 stewards penalty". Motorsport.com. GMM. 6 November 2010. Archived from the original on 16 November 2010. Retrieved 6 November 2010. ^ "Bridgestone to Cease Tire Supply to the FIA Formula One World Championship". Bridgestone. 9 November 2009. Archived from the original on 4 November 2009. Retrieved 2 November 2009. ^ Collantine, Keith (23 June 2010). "Pirelli return to F1 after 20-year absence". F1 Fanatic. Keith Collantine. Archived from the original on 26 June 2010. Retrieved 23 June 2010. ^ Collantine, Keith (18 March 2011). "Pirelli confirms six different colours for tyres". F1 Fanatic. Keith Collantine. Retrieved 18 March 2011. ^ "F1 to have mandatory weight ratio in 2011". motorsport.com. 5 July 2010. Retrieved 6 July 2010. ^ "Pirelli to supply 'extra hard' tyre in Turkey". Motorsport.com. GMM. 11 March 2011. Retrieved 10 March 2016. ^ Cooper, Adam (28 August 2011). "Tyre controversy unfolds at Spa". Adam Cooper's F1 Blog. WordPress. Retrieved 29 August 2011. ^ Noble, Jonathan (28 August 2011). "Teams' request for new tyres for Belgian Grand Prix denied". Autosport. Haymarket Publications. Retrieved 29 August 2011. ^ Noble, Jonathan (28 August 2011). "Pirelli points finger at Red Bull over Spa tyre controversy". Autosport. Haymarket Publications. Retrieved 29 August 2011. ^ Noble, Jonathan; Freeman, Glenn (28 August 2011). "Pirelli will be more cautious with camber guidelines for Monza". Autosport. Haymarket Publications. Retrieved 29 August 2011. ^ Noble, Jonathan (9 September 2011). "Pirelli ready to ask FIA to enforce camber restrictions at Monza". Autosport. Haymarket Publications. Retrieved 9 September 2011. ^ Noble, Jonathan (10 September 2011). "FIA says teams must adhere to Pirelli's Monza camber limits". Autosport.com. Haymarket Publications. Retrieved 11 September 2011. ^ FIA Formula One Commission (2 February 2010). "Formula One Commission Press Release 02/02/2010". fia.com. Archived from the original on 5 February 2010. Retrieved 2 February 2010. ^ a b Scarborough, Craig (13 December 2010). "F1 2011 Technical Regulations – Detailed and Explained". ScarbsF1. WordPress. Archived from the original on 5 January 2011. Retrieved 22 December 2010. ^ "2011 rule changes – ban on double diffusers". Formula1.com. Formula One World Championship. 3 February 2011. Archived from the original on 6 February 2011. Retrieved 4 February 2011. ^ Noble, Jonathan; Creighton, Geoff (22 May 2011). "Kolles hints at protest in Monaco". Autosport. Haymarket Publications. Retrieved 7 June 2011. ^ Scarborough, Craig (19 May 2011). "FIA: Ban on Aggressive off-throttle Engine maps". Scarbsf1. Craig Scarborough. Archived from the original on 28 June 2011. Retrieved 7 June 2011. ^ Benson, Andrew; Humphrey, Jake (11 June 2011). "F1 bosses ban exhaust technology from British GP". BBC Sport. BBC. Archived from the original on 17 June 2011. Retrieved 13 June 2011. ^ Noble, Jonathan (21 June 2011). "FIA in new engine mapping clampdown". Autosport. Haymarket Publications. Retrieved 21 June 2011. ^ Noble, Jonathan (25 June 2011). "FIA's Charlie Whiting says some teams will lose 0.5s per lap to mapping clampdown". Autosport. Haymarket Publications. Retrieved 25 June 2011. ^ Noble, Jonathan; Beer, Matt (9 July 2011). "Red Bull seeks FIA clarification as Renault teams lose exhaust concession". Autosport. Haymarket Publications. Retrieved 14 September 2011. ^ "Formula teams reach agreement over blown diffuser row". Autosport.com. Haymarket Publications. Retrieved 14 September 2011. ^ Benson, Andrew (9 May 2010). "F1 teams decide on 'F-duct' ban for next season". BBC Sport. BBC. Archived from the original on 12 May 2010. Retrieved 10 May 2010. ^ Kravitz, Ted (22 December 2010). "How new rules could change the championship". BBC Sport. BBC Sport. Archived from the original on 30 December 2010. Retrieved 28 December 2010. ^ Noble, Jonathan (25 March 2011). "FIA bans wet moveable wings use". Autosport. Haymarket Publications. Retrieved 25 March 2011. ^ Beer, Matt (23 June 2010). 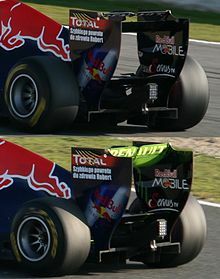 "Adjustable wing to aid passing in 2011". Autosport. Haymarket Publications. Archived from the original on 24 June 2010. Retrieved 23 June 2010. ^ Straw, Edd (20 May 2011). "Double DRS zone from Canadian GP". Autosport. Haymarket Publications. Retrieved 21 May 2011. ^ Collantine, Keith (28 July 2010). "Lowe explains extra wheel tethers for 2011". F1 Fanatic. Keith Collantine. Archived from the original on 31 July 2010. Retrieved 28 July 2010. ^ Scarborough, Craig (15 February 2011). "Blade Roll Structures – Legality (Lotus & Force India)". ScarbsF1. WordPress. Retrieved 8 March 2011. ^ "Ferrari to use KERS throughout 2011 season". motorsport.com. 14 June 2010. Archived from the original on 9 June 2011. Retrieved 17 June 2010. ^ Collantine, Keith (10 December 2010). "Five-race gearboxes among other rules changes". F1 Fanatic. Keith Collantine. Archived from the original on 11 December 2010. Retrieved 10 December 2010. ^ a b Noble, Jonathan (13 December 2010). "FIA to impose curfew on personnel". Autosport. Haymarket Publications. Archived from the original on 20 December 2010. Retrieved 13 December 2010. ^ Collantine, Keith (28 July 2011). "FIA using software to spot race incidents in real-time". F1 Fanatic. Keith Collantine. Retrieved 29 July 2011. ^ Elizalde, Pablo (13 December 2010). "F1 clamps down on driving standards". Autosport. Haymarket Publications. Archived from the original on 20 December 2010. Retrieved 14 December 2010. ^ "F1 clamps down on driving standards". InRacing News. iRacing.com. 13 December 2010. Archived from the original on 13 July 2011. Retrieved 13 June 2011. ^ a b Noble, Jonathan (15 October 2011). "Stricter version of 'one move' rule to be adopted for Korean Grand Prix". Autosport. Haymarket Publications. Retrieved 15 October 2011. ^ Noble, Jonathan (23 September 2011). "Toro Rosso breaks curfew in Singapore as Tost arrives too early to work". Autosport.com. Haymarket Publications. Retrieved 23 September 2011. ^ Noble, Jonathan (25 March 2011). "HRT uses its first curfew exception". Autosport. Haymarket Publications. Retrieved 25 March 2011. ^ Noble, Jonathan (24 September 2011). "Teams fall foul of Formula 1 curfew rules". Autosport.com. Haymarkey Publications. Retrieved 24 September 2011. ^ Noble, Jonathan (24 September 2011). "Mercedes' Ross Brawn calls for clarification of Formula 1's curfew rules". Autosport.com. Haymarket Publications. Retrieved 25 September 2011. ^ Schatten, Rob (8 September 2010). "Team member licences to go ahead". Autosport. Haymarket Publications. Archived from the original on 11 September 2010. Retrieved 8 September 2010. ^ Elizalde, Pablo (21 February 2011). "Barcelona to host final F1 test". Autosport. Haymarket Publications. Retrieved 21 February 2011. ^ Beer, Matt (26 March 2011). "Vettel storms to Melbourne pole". Autosport. Haymarket Publications. Retrieved 28 March 2011. ^ Noble, Jonathan (27 March 2011). "Renault says Petrov a different man". Autosport. Haymarket Publications. Retrieved 28 March 2011. ^ Noble, Jonathan (26 March 2011). "Hispania duo not allowed to race". Autosport. Haymarket Publications. Retrieved 28 March 2011. ^ Elizalde, Pablo (27 March 2011). "Sauber duo disqualified from Australia". Autosport. Haymarket Publications. Retrieved 28 March 2011. ^ "A load of hot air". Sky Sports. 13 July 2011. Retrieved 29 July 2011. ^ "Formula One - 2011 Standings". Formula One. Retrieved 20 April 2019. ^ "Statistics Drivers - Pole positions - In a year". www.statsf1.com. Retrieved 16 January 2019. 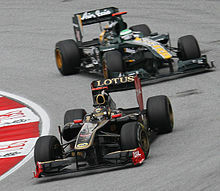 Wikimedia Commons has media related to 2011 in Formula One.